I am normally not a big fan of westerns whether in books or in movies. They are ok but not really my favorite genre. 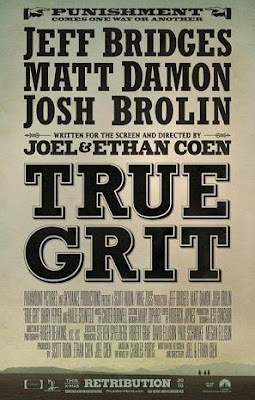 True Grit was first made into a movie in 1969 starring John Wayne who won the Oscar for Best Actor. I haven't watched all of that version but from what I did see it's drastically different from this new version. 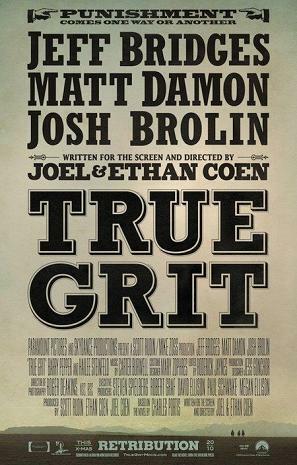 In fact, even though I had heard good things about the movie and that I had liked some of the other Coen Brother movies I had seen in the past and the actors in the movie were all excellent, if this movie hadn't been nominated for Best Picture, I probably would have passed it over. I'm so glad I didn't! It turned out to be one of my favorite movies at the Best Picture showcase. Jeff Bridges is fantastic as Rooster. He's a drunk but I really liked his character. I love how you can tell he has a soft spot for Mattie though it's clear that he's a bit baffled about her. It's a bit hard to understand him at times but I thought he did a fantastic job. Was anyone else a bit creeped out by Matt Damon's character? There's nothing bad about him but he kinda made me uneasy. I think it was the mustache. Still I really his chemistry with everyone in the movie, though the spanking scene was a WTH moment. Josh Brolin is not in the movie as much as his name on the poster makes you out to believe but he does well when he does show up. Hailee Steinfeld is the real star of this movie. You notice that she is not listed anywhere on the poster. This is due to the fact that she's a newbie and I believe that this is her first role ever. Anways, she OWNS this movie. She's in about 95% of the scenes and is wonderful it all of them. Therefore the fact that she was nominated for the Oscar for Best SUPPORTING Actress is a bit absurd but Hollywood politics deemed it so. I loved her character. Even though she's only 14 she's strong, smart, and can very much take care of herself. Mattie is a wonderful breath of fresh air after all the portrayals of teen girls who can't take care of themselves and are boy crazy all the time. The entire movie just flows extremely well. There's lots of action sequences and gun fights but it's not your typical western. A pleasant surprise about this movie was how funny it ended up being. From the trailers, it looks rather serious and grim. Therefore it was quite surprising to find myself laughing a lot throughout the movie. It's not slapstick comedy but rather witty writing that makes the characters and the plot light-hearted while being serious at the same time. Interestingly, aside from Toy Story 3 and practically 99% of The King's Speech, I found this movie to be most family friendly, which was again another surprise for me. This is not to say that I think kidlets will enjoy it but there's not a lot of offensive stuff. I will admit that the last scene in the cave with the snakes did give me the willies. I really wish that Hailee Steinfeld had won the Oscar for Best Supporting Actress but in the end it's ok. This was her first movie and I can tell that (if she chooses to) she will have a long and fruitful career ahead of her. I do wish that she had been chosen as Katniss for The Hunger Games movie as after seeing her in this movie, I felt that she would have been perfect in the role. (Yes I know the objections to her so no need to mention again :) The movie was nominated for 10 Oscars overall but sadly did not win any. Still they were all highly deserved nominations. As I said, this was one of my favorite movies of the night and I'm looking forward to rewatching it again when it comes out on DVD. I really am happy I got to see this movie in the theater! It made me miss the west so much! I thought the two movies were very similar. The biggest difference was in the end, which this newer one is likely closer to the book, but up to pulling her out of the snake pit I was surprised at how close they were. I love John Wayne and have seen the first one several times. This one is great too and deserves the shelf space alongside. I thought Hailee was outstanding as well. I thought she was adorable and couldn't believe they called her ugly in one scene.